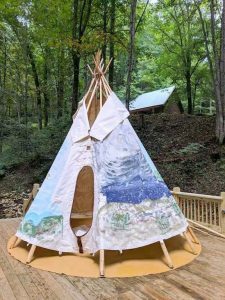 TIPI at Wilderness Lodge new in 2019! the TIPI at Wilderness Lodge! 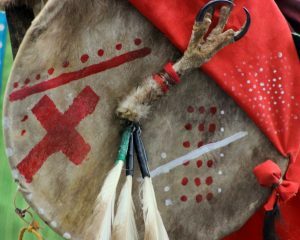 The 14′ diameter tipi has been painted by Joy Putterman an accomplished local artist. She painted the exterior with themes capturing the surroundings of the mountains. where the tipi is placed… alongside the creek. ready for use soon (weather permitting). NOTE from December 2018: I sat in the teepee for awhile yesterday. It was a relaxing experience listening to the stream flowing nearby. Seemed like I was a world away from everyone! Joy Putterman painting the teepee. privately situated by the creek yet can be seen from the house. 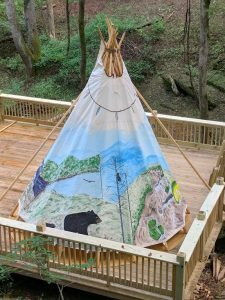 WHAT’S INCLUDED in the TIPI? WHAT OTHER AMENITIES ARE NEAR THE TIPI? There is no additional charge at this time for the use of the tipi when renting the log home or studio apartment. we’re just adding to the experience! Copyright © 2019 Wilderness Lodge. All Rights Reserved. The Matheson Theme by bavotasan.com.